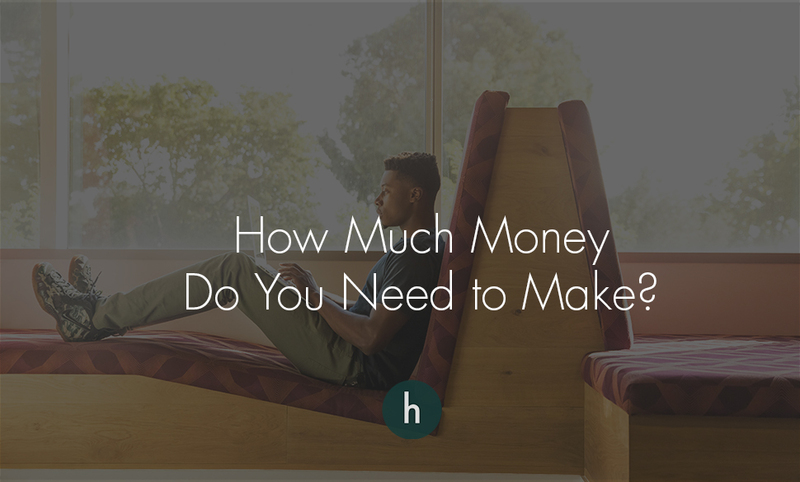 Knowing how much money you need to make is crucial when you’re thinking about or have just started your own business. In theory it’s simple, but in practice it can be challenging. It starts with understanding how much money you typically spend and save. And it takes into account how much you want to change your spending and saving. Once you have a general range of how much you need, you can start to do things to impact the income number. Control the things you can control like investing in your company to earn more or cutting back on unnecessary expenses. If you don’t even have a target, it’s tough to know where to aim or how to make your chances of hitting the target better. The first step to figuring how much money you need to make is knowing how much you need for your personal expenses. I come from the school of thought that the best way to figure out how much to budget is to track your expenses for three months. I use actual data as a basis because at least you’re starting from reality and not your beautiful and wonderful and robust imagination. (Read: I don’t trust that you know how much you spend on things like clothing or over-priced avocado toast). Your first option is to pull the last three months of statements, use a calculator and spreadsheet. It’s tedious but it’s accurate, but you can start now. Another option is you can track expenses for the next three months using mint or personal capital or some other app out there. It’s less tedious and you push off being financially responsible for three beautiful months. Another option you have is to use the bank’s technology to help you. Most banks compile a year-end summary or a year-end spending report. Download yours from last year. It might have inaccuracies because the bank’s AI machine thingy is doing it, but it might be a good place to start. After you choose your method, download the data you need and get organizing. Even if you use an app, I still like using a spreadsheet, obviously because I’m a dork, but I like the creative control I have over how I see the data. The first layer of expenses are fixed expenses. There are the bills and expenses you have that you are obligated to pay each month. So things like rent, utilities, groceries and any loan payments. I call this category fixed expenses, even though groceries can vary, they’re fixed because you must spend in this area every month. The next layer of expenses are called discretionary. They’re things that you don’t necessarily need to spend on each month, but they make life better. Often it’s clothes, your hobbies, your vices and other fun, recreational stuff. The third layer of expenses are what I call ancillary expenses. Think of these as expenses you’d cut if you had to go on a wartime budget because you’re pivoting your business and it’s slow or your company isn’t as profitable as you thought it would be. So things like putting away money into savings, investments and giving it away as charitable donations. Sidebar: Taxes I add taxes into this category to because they’re a function of income. If you aren’t earning money, you don’t pay taxes. But taxes are unique snowflakes, they’re dependent on everyone’s unique situation. More on that later. If you’re only looking at the last three months of expenses, don’t forget to add in things you might pay only once or twice a year like property taxes or insurance payments. Whether you use a spreadsheet or an app or a website, get a monthly total and an annual total. If you get sticker shock because of how much you spent, maybe you should create a projected budget and modify some of the figures. Next, figure out how much your business will cost you… to set it up. If you haven’t started your business, how much are startup costs or pre-launching costs. Do you need to pay for a website and business cards? Do you need purchase $10,000 worth of Herbalife before you can start selling (please, don’t do that). Or do you need to buy a building and set it up to grow 100 lbs of cannabis because you want to start a cultivation center? Figure that number out. Then, figure out how much it will cost you to run your business each month. What are your monthly bills? How much is your email service and all the apps you need? If you’re already running your business, then take a look at the last three months of expenses and figure out an average cost. You can also look at a range of how much spent. For example, $25-50/month. The safest bet could be to take the maximalist approach and assume you’ll spend the higher number each month. It can be scary to take the maximalist approach, but likely safer because you’re building fat into the budget. You’ll have variable costs the way you do with your personal budget. Things like the costs of having coffee meetings or marketing expenses. Don’t forget the one-time costs like paying your accountant or if you pay for annual subscriptions. A little commercial about taxes. Disclaimer, Im not an accountant, so this isn’t tax advice. This is advice that you should get tax advice. If you have a pass-through entity, like an s-corp or LLC, your taxes might be limited to city taxes or sales taxes and not federal income taxes. But remember what I said earlier? About taxes being unique snowflakes. Let’s look at an example. Let’s say Marion is a florist and he pays himself $46,000 from his s-corp. His company, Flowerz by Marion, ends up with a profit of $50,000 at the end of the year. Now let’s say Charlie runs a company that teaches little kids how to play golf, Putz by Charlie. And she also pays herself $46,000 in salary, but her LLC ends up with a $15,000 loss at the end of the year. Even if their salaries are the same, their companies financials vary. What I’m trying to convey is that small business owners have an additional layer of tax complexity because with pass-through entities (s-corps and LLC’s) the net profits (or losses) flow through to the owner’s personal taxes. So now you can figure out your business’ monthly and yearly expense. Now that you know that, I want you to breakdown how knowing your monthly number breaks down into income goals. For example, once you realize you need to earn $8,000 to pay yourself and run your company, how can you frame that in regards to how you make money? If you charge $150/hour, then you’d need to bill about 54 hours a month to earn that income. If you work on an $8,000 a month retainer, how many clients on retainer do you need each month? After you make your income goal, it’s up to you to reflect on how realistic the goal is. Maybe you need to change your spending and pay yourself less or maybe you need to raise your rates so you don’t have to work crazy, long hours.